A combined approach in teaching ICT and EFL skills, offering basic training in digital literacy for EFL students aged 12-18. Digital Literacy for EFL Students is a course designed specifically for learners of English as a foreign or second language at Intermediate (B1-B2) level, aiming to advance their linguistic competence through the use of digital technology. The course comprises of five modules: Blogging, Web Design, Filmmaking and Video Editing, Social Networks, and Presentation Skills. What is DIGITAL LITERACY FOR EFL STUDENTS? In an increasingly dynamic and globalized world, where technology constantly offers new assets for a greater connectivity among cultures, groups, and individuals, we need to focus on developing the basic skills required for young learners to fully develop their potentials to be truly involved in the digital age that we, as educators, are preparing them for. English language skills and ICT skills are the main skills required for 21st-century literacy. By introducing a combined instruction between these two subject areas in order to produce a common intellectual output can create the necessary context for students' full engagement in the learning process, allowing individuality in their expression of ideas, with proper guidance facilitated by their educators. 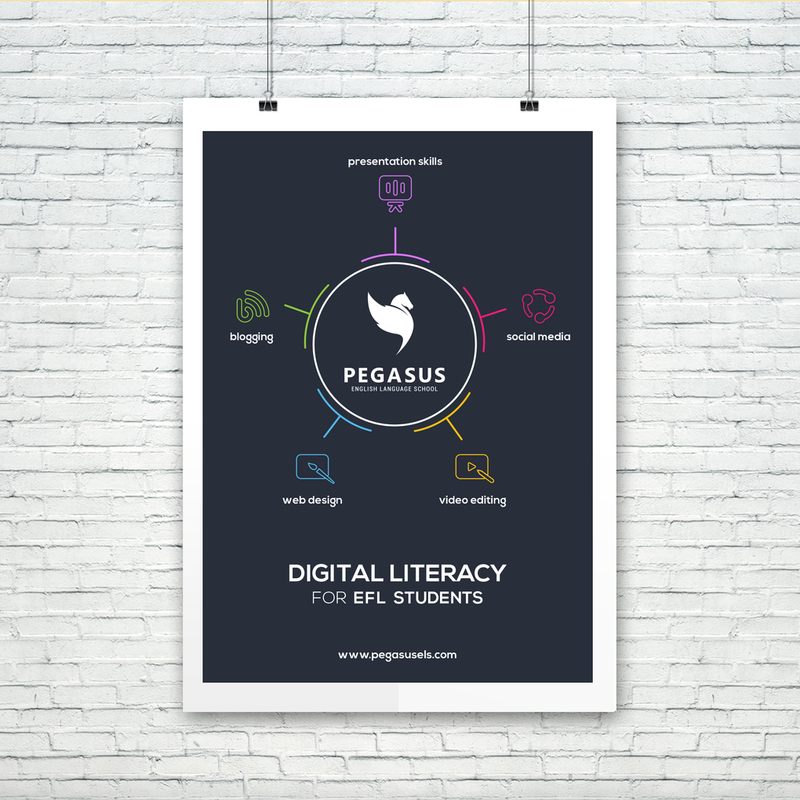 Pegasus English Language School, located in Tetovo, Macedonia, is a pioneer in promoting Digital Literacy for EFL Students in the country. The school offers a model of blended learning (Flipped Classroom), combining both EFL and ICT instruction to bring the process of acquisition of new skills to yet another level, where students will be able to produce their own digital products, using English as a language required for a greater impact in sharing and promoting their ideas beyond their local communities. Therefore, Digital Literacy for EFL Students offers a step-by-step process in facilitating students' production of content for their blogs, websites, videos, and promote them on social media by advancing their presentation skills as well, focusing on networking and creating online communities, where they could share and exchange ideas. 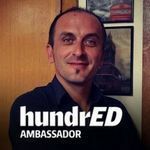 It is a unique opportunity for students of EFL and ICT to combine their skills in order to increase their visibility in the ever-changing digital world we live in. Digital Literacy for EFL Students provides a meaningful context for the further development of students' entrepreneurship skills by introducing digital branding for products and services, using the skills they will acquire during this course. In this way, students are provided with the necessary tools to use a set of skills that are required for success in college, career, and life. Digital Literacy for EFL Students was a finalist in the category of Local Innovation at the ELTons 2017 Innovation Awards, organised by the British Council in partnership with the University of Cambridge (Cambridge English Language Assessment). Technical equipment: One-computer classroom and a video projector, 1 laptop per student, Internet connection. Digital resources: Edmodo for tasks and written assignments (www.edmodo.com); Wordpress for blogging (www.wordpress.com); Padlet for additional student resources (www.padlet.com). Video editing tools: Final Cut Pro and Youtube Video Editor. Presentation skills (www.prezi.com, Microsoft Office Powerpoint). It is a new and adventurous way of teaching digital skills to students of EFL. Digital Literacy for EFL Students is an innovative programme for teaching ICT and EFL skills, offering basic training in digital literacy for EFL students aged 12-18. Students learn the basics of blogging, focusing on successful blogs from young bloggers under 18. They are introduced to the types of blogs, as well as what it takes to make your topic interesting for a bigger audience. They learn how to set up their own blogs, and post comments to their classmates. Connecting with other bloggers from the group by commenting on each other's blogs. Students learn how to develop content for their blog posts. Students learn how to post comments to the second blog posts of their classmates, and generate interest for their favorite topics. Students are encouraged to continue developing quality contents for their blogs. Students are shown the basics of using HTML for building a web space. Students provide comments to their 3rd blog posts. Students write their 4th blog posts. Students post comments to their classmates 4th blog posts. Students prepare and post their 5th blog posts. Students learn how to design a website. Students write short introductions, and texts on a selected topic. Students develop comments to their classmates 5th blog posts. Students prepare and post their 6th blog posts. Students develop their presentation skills. Students prepare texts and design a section on their web page related to a topic of their interest. Students write text for their blog posts and develop content for their website. Students prepare texts for their blog posts. Students develop a storyboard and prepare the script for the video they will produce. Students practice various shots and angles with different cameras. Students develop contents for their blog posts. Students record their videos and learn the basics of video editing using a video editing tool. Students prepare texts for their blog posts. Students finalize the editing stage of the video. Students promote contents online. Students are encouraged to continue blogging and be independent in developing contents for their blogs. Students are encouraged to share the contents they produced during the course on all social networks available to them.